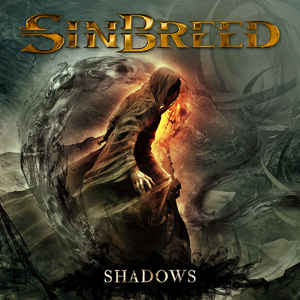 SINBREED's debut album When Worlds Collide showcased the band's power/speed/melodic metal style and landed them on many "Best of 2010" lists. In addition to being an immediately likeable record (check out the video for "Dust To Dust" right HERE as evidence), it was a strong and polished statement of musical intent. Shadows shouldn't disappoint any of their fans (or anyone interested in classy power metal), as it continues in a similar vein. The vocal melodies and guitar riffs are still memorable yet tough, keeping them far away from the "flower metal" tag that can be applied to many of their European contemporaries. Herbie Langhans' vocals really help in this department; he has plenty of range, but his approach is more muscular and gritty rather than clean, high and, well.....nasally. The rest of the When Worlds Collide lineup remains intact and adds BLIND GUARDIAN guitarist Marcus Siepen (joining BLIND GUARDIAN drummer Frederik Ehmke). Even with these two on board, I detect little if any discernable BLIND GUARDIAN influence. Depending on your perspective this may be a positive or negative; personally, I think that SINBREED is playing it smart by maintaining their own identity. It wouldn't make a lot of sense for Marcus and Frederick to participate in a project that was a watered-down version of their very successful home base - or lend their talents to a band that was anything less than a strong entity in its own right. I think their support says a lot about guitarist and leader Flo Laurin's vision for SINBREED. By the way, to complete the picture, I can't fail to mention that bassist Alexander Schulz admirably holds down the bottom end. Shadows contains plenty of speed and aggression, and is somewhat some darker, heavier and more intense than SINBREED's previous work. "Black Death" and "London Moon" are good examples of this approach. The final track, "Broken Wings", is the only song that includes some clean/acoustic guitars in the intro and outro; the rest of the disc is basically a full-on affair. Flo and Marcus' rhythm and lead guitar work is at a high level overall. I noticed some modern rhythmic touches occasionally creeping into the guitar ideas, but it's done tastefully and doesn't seem forced. Shadows still features plenty of riffs, but I also noticed that the dual guitar melodies (i.e., IRON MAIDEN, JUDAS PRIEST, HELLOWEEN) are more prominent than before; not a surprise considering the addition of a second guitarist from another long-standing dual guitar outfit. The disc is well-executed from every standpoint, and the production is crisp without being harsh; all of the instruments are clear, but the mixing and mastering don't tear your head off (courtesy of Markus Teske, who has also worked with SYMPHONY X). I won't get into a boring song-by-song account, but "Bleed", "Shadows", "Call To Arms", "London Moon" and "Broken Wings" are standout tracks. You can check out the video for "Bleed" right HERE. The verdict is that Shadows may not be quite as immediate a listen as When Worlds Collide, but it measures up well. If you like top-notch aggressive melodic power metal, Shadows is an excellent disc and a worthwhile sophomore effort. Preorder your copy of Shadows in the KNAC.COM More Store right HERE.